Operated by Quoine, a next-generation fintech company involved in various blockchain-focused projects, Qryptos is a cryptocurrency exchange which brings quite a few fresh ideas to the table. Always set on innovating and adding new features, Quoine appear to have much bigger plans for the project though. In fact, Quoine are involved hook, line and sinker, with a number of similarly innovative, high-profile cryptocurrency projects. Besides Qryptos, they also run Quoinex, another crypto exchange, the technology of which is what currently powers Qryptos. Quoine Liquid is yet another project of theirs, which aims to be a global liquidity platform, built on its own crytocurrency called Quash. Quoine is not your run-of-the-mill fintech company from any angle. Before we take a closer look at the operation and at the people running it, let’s get the question of legitimacy out of the way: this operation is indeed as legitimate as it could possibly get. It has recently become the first global cryptocurrency firm to be licensed by the Japan Financial Services Agency. Its license number is 0002. Some of the early reviews of Qryptos and Quoine have made a point of stressing that the services delivered by this financial outfit have a global reach, with the exception of the Japanese market. These days, the Japan exception can be dropped too: Quoine’s reach is indeed truly global. The company maintains offices in several countries. Their Head Office is based in Japan, their Global Business Development branch is located in Singapore and their Tech and Customer Support operates out of Vietnam. The Board Director of the company, Masaaki Tanaka, used to work as a Board Director at Morgan Stanley, and a Deputy President at Mitsubishi UFJ Financial Group. He is currently an advisor with the Japan Financial Services Agency and Price Waterhouse Coopers International. Every member of the board of directors is featured on a special page of the Quoine website, with short bios and photos. Back to Qryptos: What Exactly Does it Do? Launched in June 2017, Qryptos set out to revolutionize the cryptocurrency industry. The operation does away with the fiat currency aspect completely: only cryptocurrencies are accepted at the site, and of these, more and more are supported each passing week/month. The specialty and unique selling point of the operation surfaces upon the addition of new cryptocurrencies. To stimulate initial liquidity, the exchange offers negative trading fees on new coins. That’s right: the exchange actually pays people to trade certain currencies. While this seems like quite the stroke of genius when it comes to securing early liquidity, the community at large has been rather reserved about Qryptos’ services thus far, in the sense that they’re not jumping on the opportunities in droves. 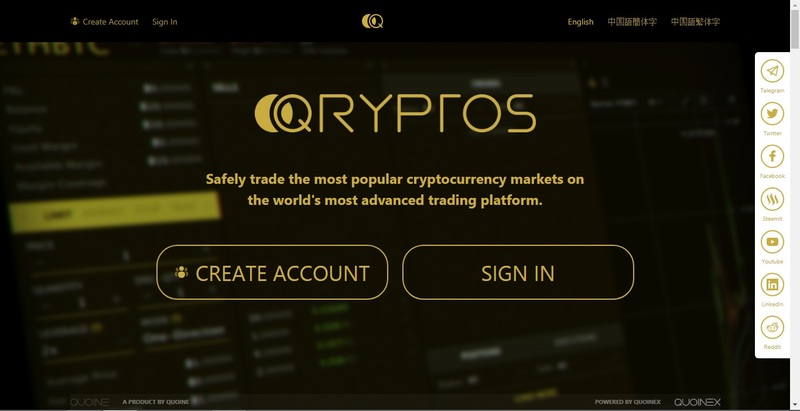 This issue may also stem from the fact though that – while sleek and well-designed – the Qryptos website does a poor job at conveying the negative trading fees message. The attractive fee structure should be featured prominently. How exactly do market makers get paid though? Simple: they are paid 0.075% on every trade that they make, and they pick up the reward directly. That may not seem like much, but the mere existence of these negative fees is quite a big deal indeed. This 0.075% is essentially half (50%) of the taker fee collected by Qryptos. This is how the operation maintains this reward-model: by essentially donating 50% of its fee-based revenues on certain cryptocurrencies, to the market makers. The taker fee is set to 0.15%, which is indeed quite competitive as it is too. By comparison, an exchange such as Poloniex charges market makers some 0.10-0.15%, depending on the market. Takers pay fees in the 0.20-0.25% range. The operator has recently launched a beta desktop client, which has further facilitated access to the platform for experienced traders and beginners alike. Qryptos are very keen on this operational aspect. They comply with all the Anti-Money Laundering and Know Your Customer requirements of their home jurisdiction of Singapore, as well as the current global AML and KYC standards. What this means for users is that they will be required to navigate some potentially uncomfortable verification, before they gain access to the platform. Multi-factor authentication, a combination of multisig Bitcoin wallets with cold storage, private API keys and private servers round out the Qryptos security picture. Existing Quoinex clients, who are interested in taking part in the trading action at Qryptos, will be able to use their existing login details to access the platform. Most popular crypto markets are available at Qryptos: BTC, ETH, XRP, LTC, Dash, Monero, Stellar, NEM, BCH and more. In addition to the above detailed exchange-focused services, Qryptos also offers an open API, which is available directly at the site, complete with full documentation. At the speed these folks are moving, these “future plans” aren’t really plans, but rather features that are already in the works. It looks like the Qryptos team is aiming to turn the platform into a safe ICO platform, where newly launched tokens can be listed and traded. Their negative trading fees model does indeed suit this approach to a T.
While dipping a toe into the rather controversial ICO angle may end up drawing more scrutiny upon Qryptos, the team is confident that their solid KYC checks, coupled with a number of stringent preventive measures, will in fact revolutionize the ICO game. Those who open an account at the exchange, will gain access to upcoming token listings. According to the Qryptos website, the ICO/trading platform will soon become accessible from mobile devices too. A very solid, regulated and transparent operation, built on a unique and feasible business model, Qryptos has been created to tackle a very controversial crypto-industry issue: that of ICOs. Will these guys succeed where others have failed? If they won’t, it certainly won’t have been for lack of ambition. Please leave any feedback – positive or negative – about QRYPTOS by commenting below. Read other Cryptocurrency Exchange Reviews. Thanks for reading our Qryptos review. To receive relevant cryptocurrency news and scam warnings directly to your e-mailbox, feel free to subscribe to ScamBitcoin.com! I’m struggling still 7 months to withdraw my stellar Tokens. You should absolutely avoid this exchange. ” legitimate as it could possibly get” What a lie! Is that a joke? Qryptos has arbitrarily blocked or banned thousands of verified customers with zero explanation, zero replies from customer support, funds stolen. How many millions have they stolen without any enforcement from so called regulators? Their KYC process is a load of bollox. I sent them a drivers license copy along with an insurance certificate copy. They just find every reason to unverify you. It’s like your a terrorist or something. This exchange is the opposite of the crypto community spirit. withdrawing from this exchange is crazy. Days. Stay away. Total scam, give you a deposit address . You provide them with proof of the deposit and nothing. Sites like this and Yobit make it very hard cor crypto acceptance. Scam, scam,scam!!!!! Do not put money in an account. they will give you every reason the the world why they can’t verify your account. They are a scam yes most definitely they have stolen allot of money. This site should be taken down and the CEO’s their days are numbered. SCAM!!!!! Stay away, your money stays hostage cause they will not verify your account. Also I traded 3200 Tron at .20 USD and only got 3300 Dent which was suppose to be .08 USD. I tried to quickly sell back and get my Tron and only ended up with 820 in a matter of 5 sec. Thieves.. Looking for another exchange. Taken 6 days and still in pending verification status after submitting my documents. did you get your money? I am still waiting to have my account acctivated! I keep sending them emails but never gotten any reply for them, really regretting opening an account with them. Not fast, money withdraw only possible after sending your ID documents; Withdrawal takes DAYS !!! Not minutes, for any coin!!! – so the main reason why this is happening is because they have said they put a lot of stuff in cold storage in order to be more secure. They also have some extra days because it’s a very very very secure exchange. Founder was VP at softbank and they have investors from ex: execs of major companies (Yahoo, Credit Suisse, Goldman Sachs), and and Japan’s richest man. They’re honestly not trying to scam anyone. Other than that, as a heavy trader, it’s prob one of the best exchanges out there. You can add a lot of custom settings to have your trade view be very unique. This is the worst cryptocurrency exchange I have ever used. They have held a withdraw for 3 days. When you email them, you will either get no reply back or a canned response. They never answer your questions. My Eth is still in pending status after 3 days. Never trust them. I will continue to tell my experience on the internet to discourage people until they do the right thing and simply release my funds. I hope you are listening Qryptos!!! (END) I hope Qryptos is not ripping people off!!! Yeah, they got me as well. Transferred GET from HITBTC to Qryptos, checked wallet address to deposit in to. Everything was correct. On HitBTC it showed the transaction was successful. I’ve sent multiple E-Mails to NO response whatsoever. They are a good scam indeed. Deeply regret signing in to Qryptos. Hello! How long it takes the registration process, and how long it took to exchange to Rippple coins? Could you buy ripple coins directly? Thank you! They are!!! They got me!! !